This calendar is fast. And soSIMPLE to use. Download and start scheduling right away! 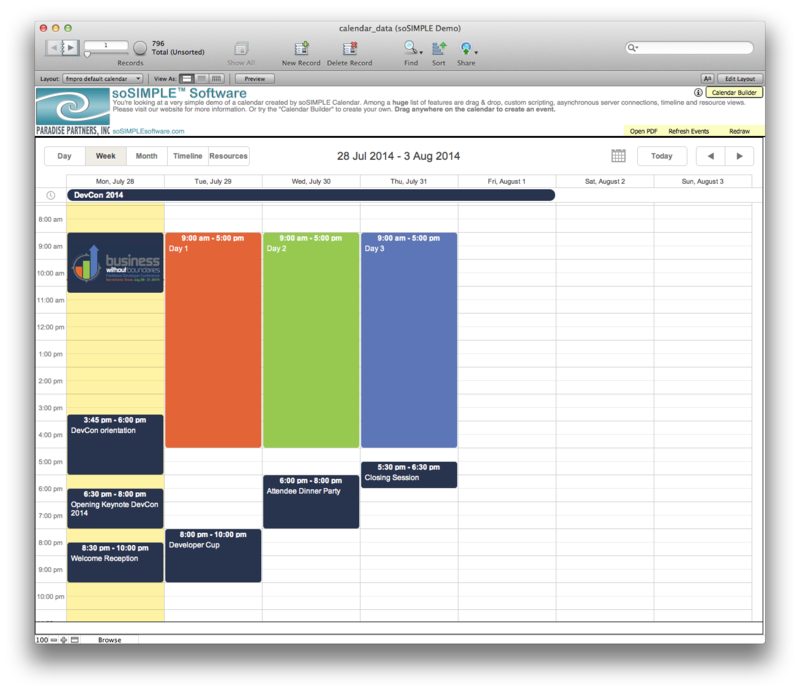 soSIMPLE now comes with a full calendar solution. Use ours or roll your own. 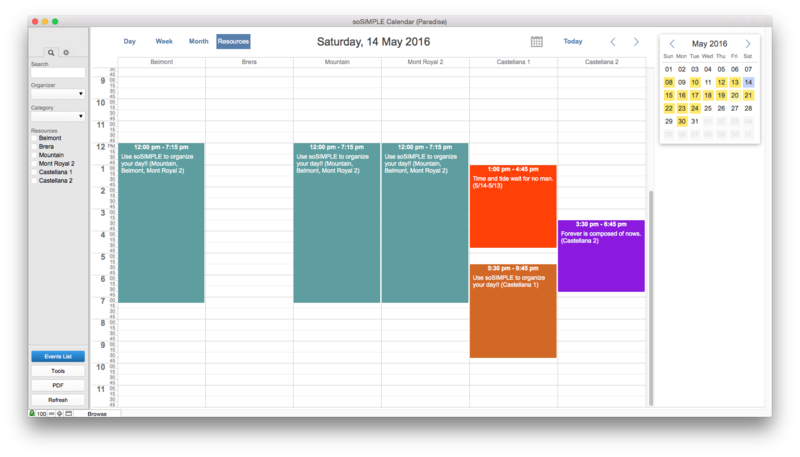 Quickly change time, duration or resources by dragging around on your calendar, the way drag and drop was meant to feel – fluid and reactive. 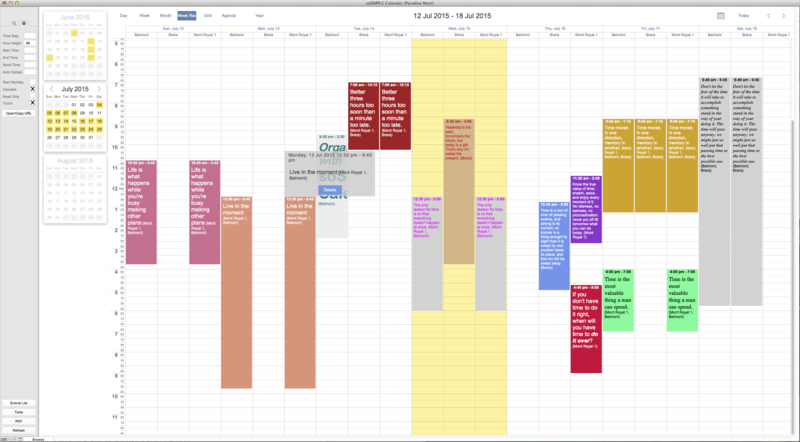 Work fluidly with your calendar. No more waiting around for the calendar to load, or for an event to be updated. Calendar updates asynchronously, so your script can keep on doing other things (Server-Powered mode). 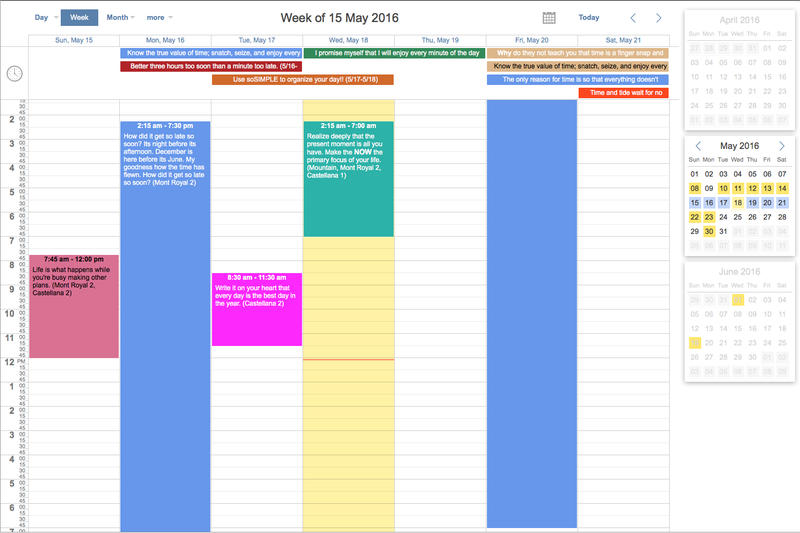 Only show the views you want – don’t clutter your calendar with views you’ll never use. Access to over 25 different views instantly. Standard views and then some. Organize your staff, rooms, trucks, equipment, etc. Resources along the top / time of day along the left. Unlimited resources – this is a scrollable view. Unlimited multiple resources assigned to events. Just like the resource view, but for a full week. A birds-eye view of available resources a week at a time. 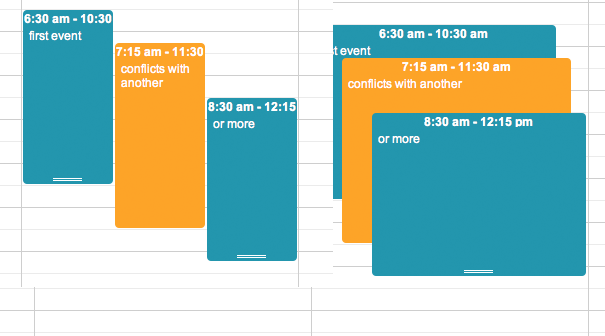 Work with your resources’ schedule across ANY length of time. Resources along the left / time along the top. 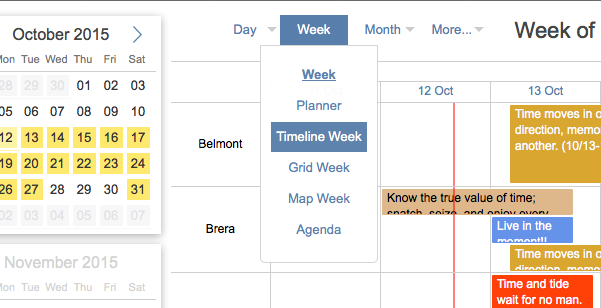 Built-in timelines for day, week, month, and year. 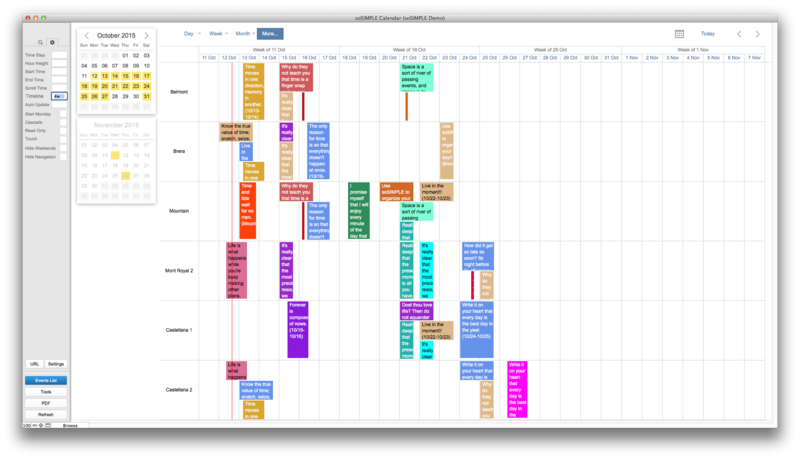 Visualize your schedule based on the locations of all of your events at once. Built-in maps for a day, week, month and year. 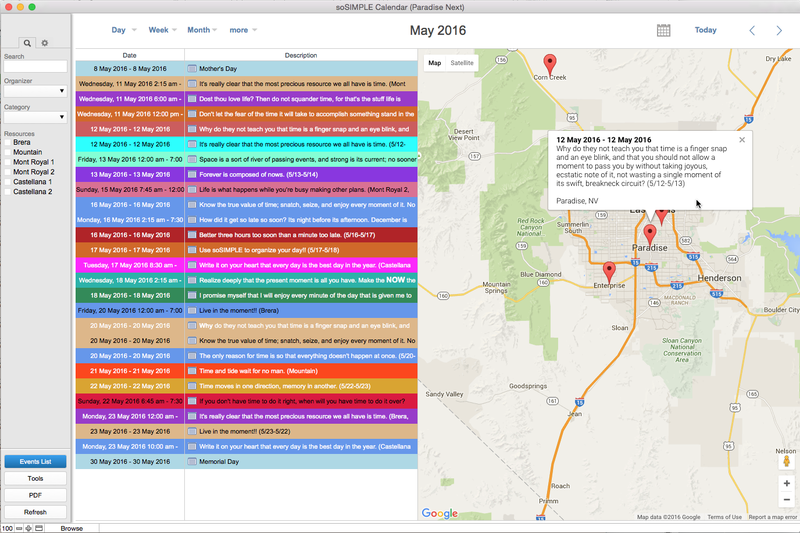 Unique use of Google maps to help plan your schedule. 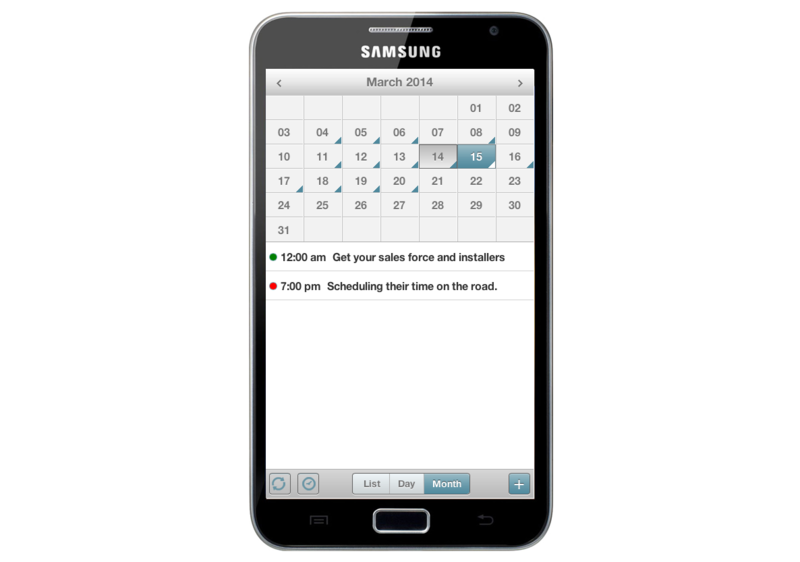 Great for scheduling work in the field, for installers and trucks. Sometimes you just want to show a simple list of your events. This list is sortable by description or date & time. Built-in for a day, week, month, year, and all future events. Just like the old DayTimers. 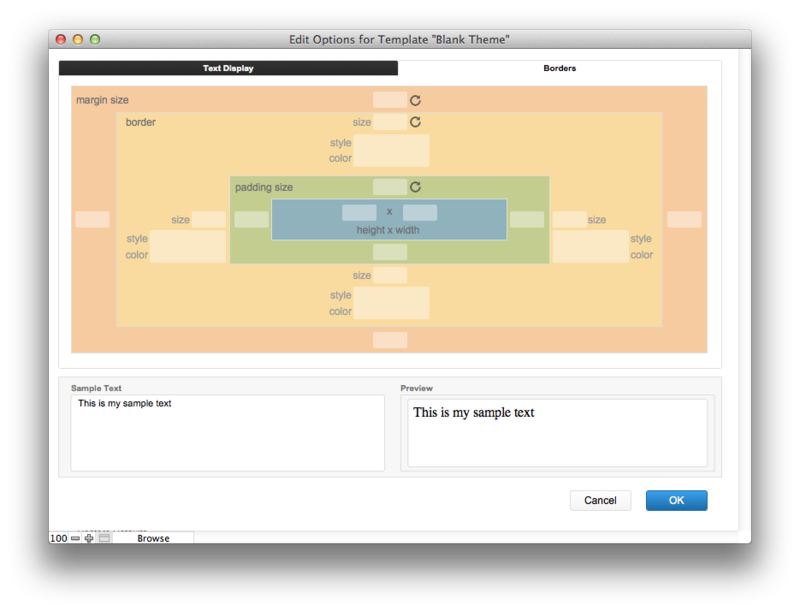 You think soSIMPLE is a champ in FileMaker Pro. Wait until you take it out on the open road…. Check it at home on your iPad. Connected to your FileMaker Server, or standalone on your device. Anywhere you need it, soSIMPLE delivers. 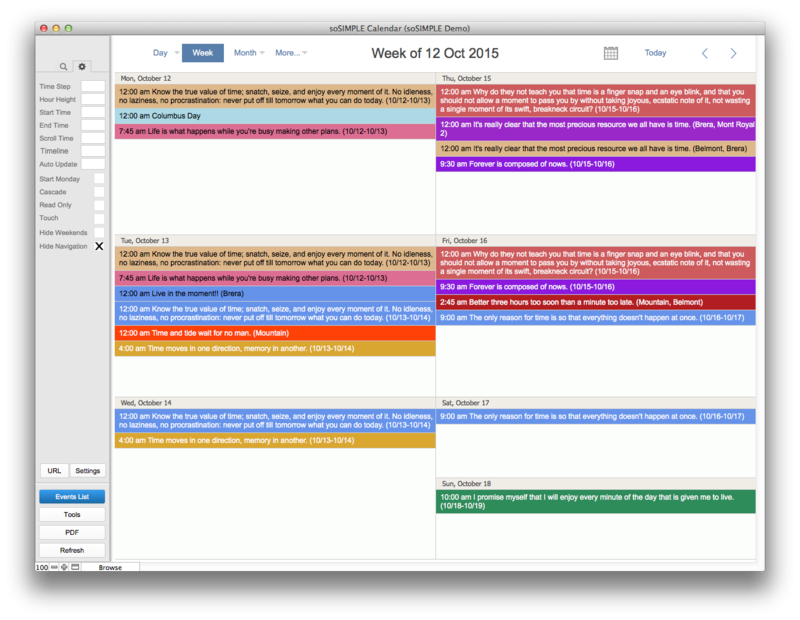 Give your road warriors easy access to their calendar. Special interface for small screens, like iPhones. 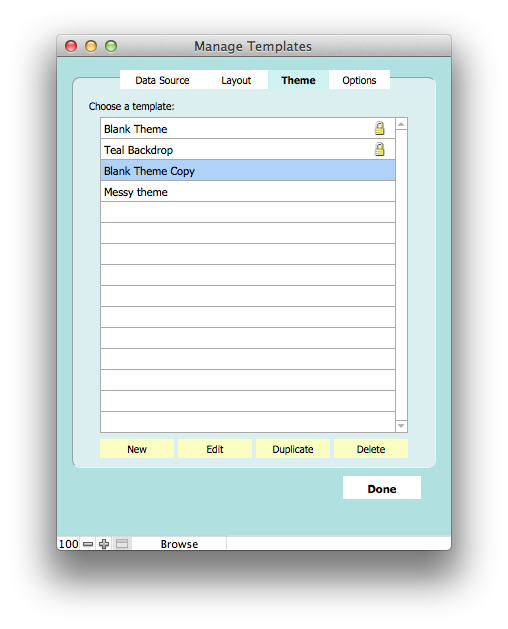 Equally at home inside FileMaker Go, or living on its own in an Android web browser. We’ve even made them web apps, so you can have an icon on your launcher to get right into your calendar, making it look just like a native app. 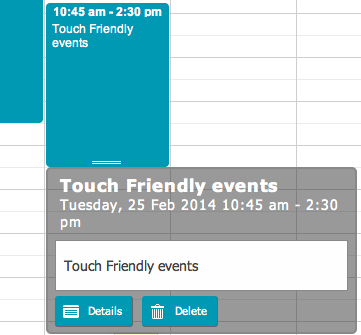 Drag & drop events using your tablet, too. 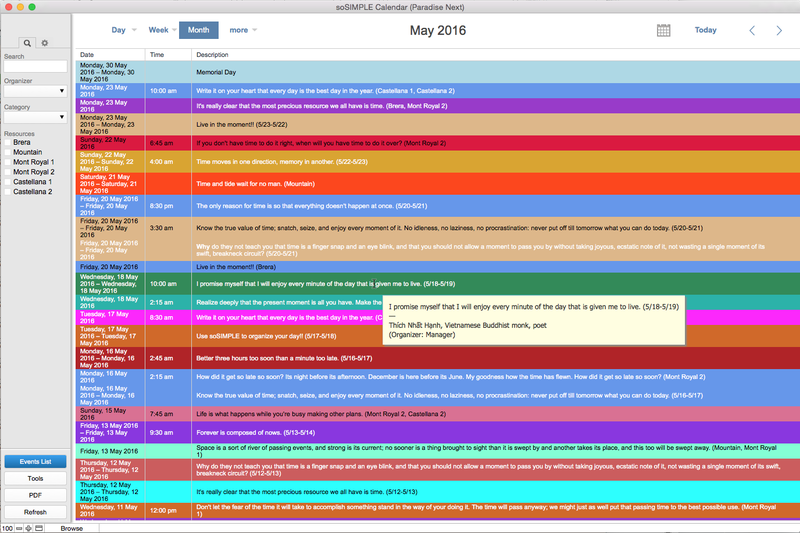 Works as a web app on your tablet, too, so you can add it to your desktop and hide the browser navigation, making your calendar work just like a real iOS or Android app. soSIMPLE is equally at home in your browser. 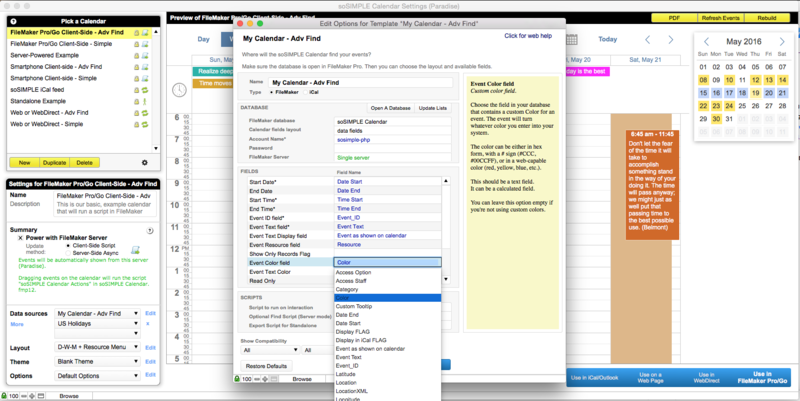 Give your sales people or your customers the ability to read and edit the calendar from any browser, anywhere. 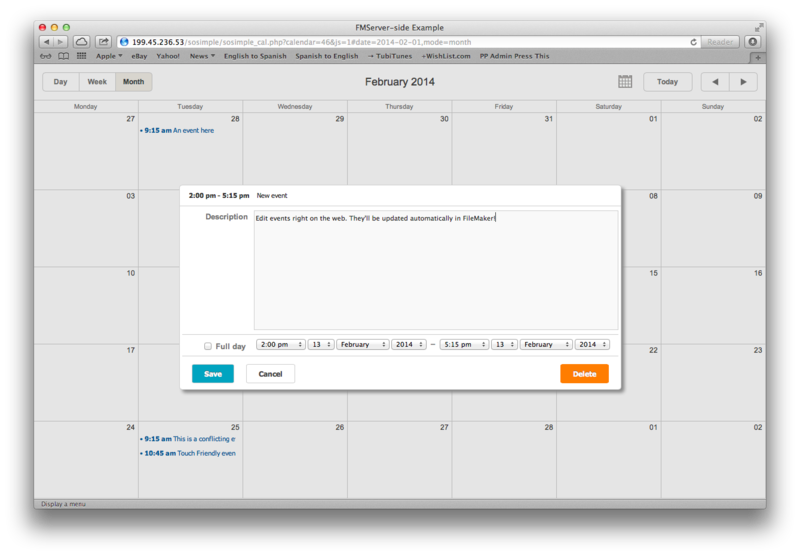 That’s right – a fully editable calendar from any browser. The updates are all made automatically in real time. Quick adjustments make it work the way you work. Dynamic filtering or fixed filtering. Show only your own appointments. Switch between different rooms, trucks, or other resources. Format text any way you’d like. Add an image to the event – a lock icon for read-only events, or an airplane for travel. soSIMPLE will take care of the line wrapping. 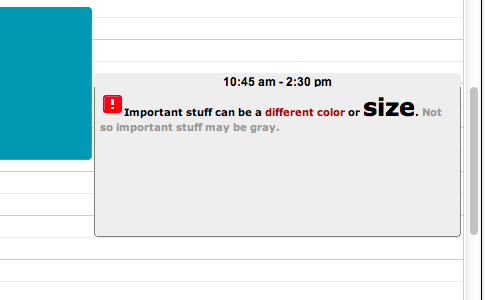 Even the tooltips can be customized with as much detail and clarity as you’d like. Add images, links, formatting, you name it. Identify important or related events immediately. Show all John’s stuff in fuchsia, all Susan’s in teal. It’s just a field in FileMaker. Show banners for events past one day. Just a field in FileMaker. Some events just shouldn’t change. Events update automatically, asynchronously, in the background. Overlap events or keep them side-by-side. Change look & feel on the fly. Great for getting a new perspective. Users can have their own preferences. Quickly see what’s happening now. An indicator moves throughout the day to show you current events. Today is its own color. 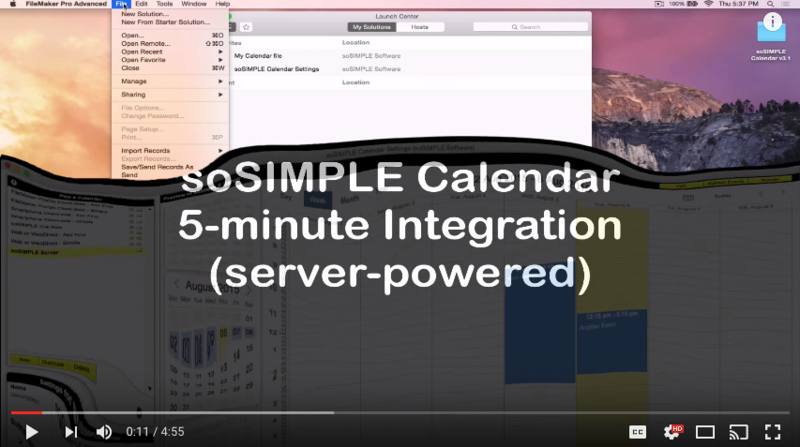 soSIMPLE Calendar Settings is the tool where you set up your calendar. Field mapping, themes, layout, options, etc. 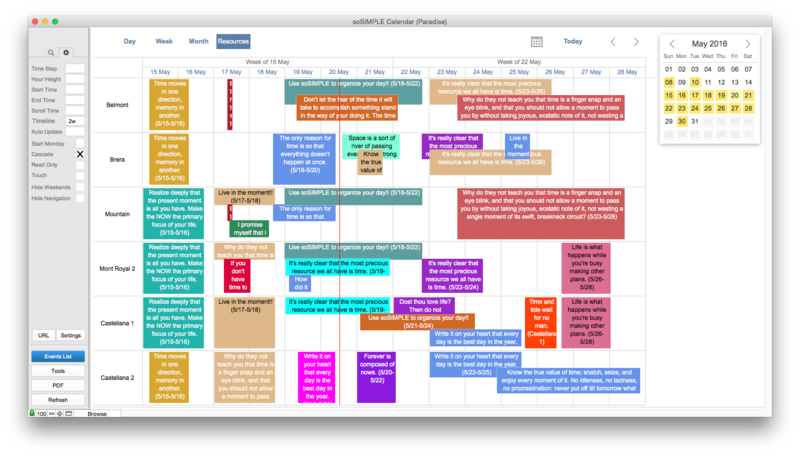 Hundreds of options to make your calendar not only robust, but extremely customizable. 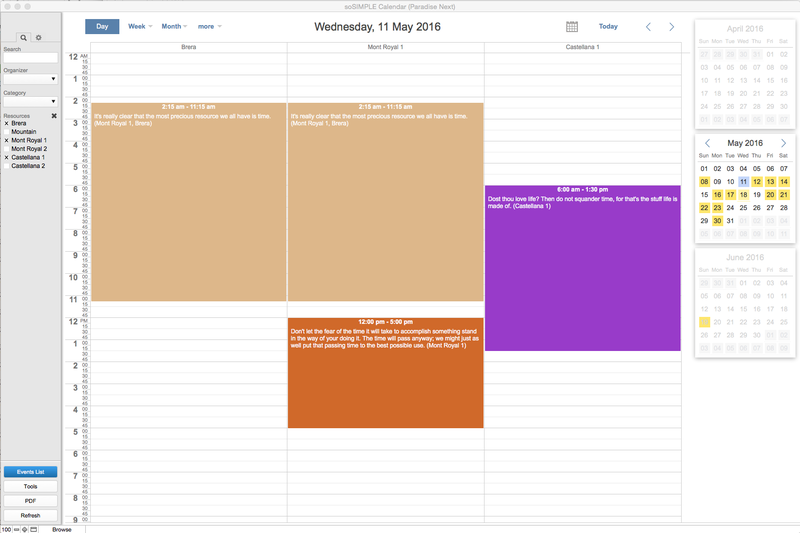 Make your calendar look the way you want, and behave the way you want. From color and font, to height of your rows and what happens when you click & drag. It’s all under your control. Get moving quickly with pre-built themes. Just point to your data, and we’ll draw the calendar. Choose glossy, flat, or rounded. Then customize them as much as you’d like. Show your calendar different ways to different people. Share themes and settings with another calendar. Same data, different data, doesn’t matter. Variables are automatically set with detailed information. Make the change without user interaction – that’s fine. 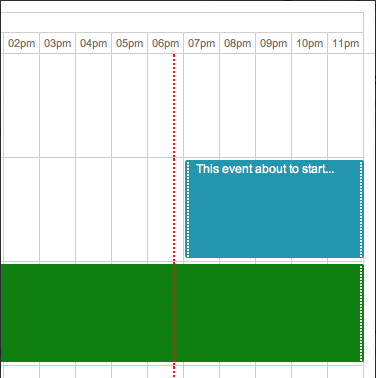 Open an event window to confirm changes – that’s good, too. Run validation, build other events, whatever you’d like. 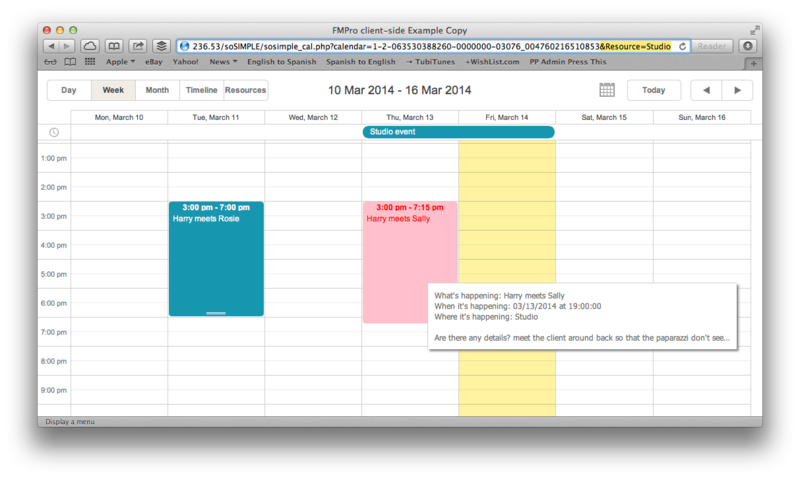 Specify what events show in your calendar when you set up your calendar. Dynamically filter your calendar further using a URL query string. Virtually unlimited filtering control using an advanced server-side find script. 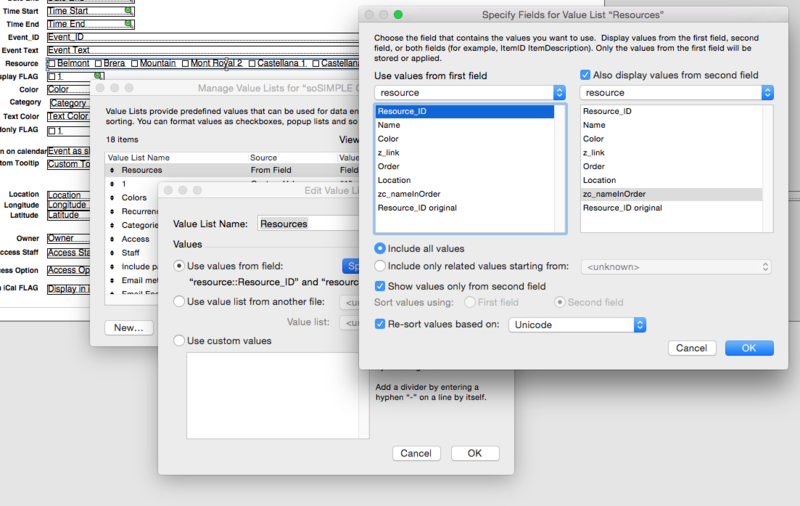 Resource lists are generated by standard FileMaker value lists. Assign to an event by value name, or by foreign key. For web calendars (Server-Powered), whether it’s for validating data entry, or adding additional data, a server-side script in your database can be run every time an event is added or changed. Chances are we support your language. The months, days and interface elements automatically translate to your language. If you don’t see your language, we can add it for you. 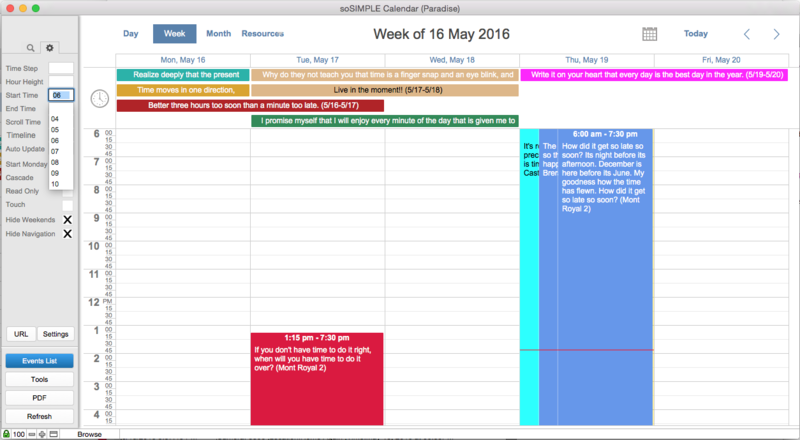 Managing calendars in multiple time zones, this tool will work for you. 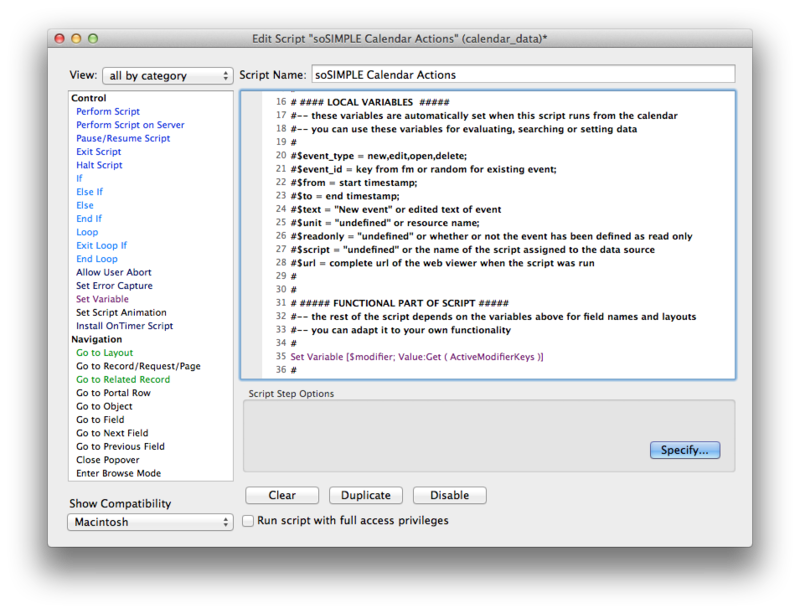 Store the event times in FileMaker in UTC, and soSIMPLE will display them in the local time of whatever computer is being used. soSIMPLE was designed so that you can add a robust scalable calendar to your solution, with a lot of flexibility, and without any coding. But sometimes you want to take it further – maybe a specific type of timeline, or multiple timelines; your own specialized drop-downs or validation on your server-side fields; maybe a custom workflow, or even a full soup-to-nuts FileMaker-based scheduling solution. We’re here to help. Allow our team of professional developers to work with you on creating your perfect calendar solution.